Welcome to the 52nd edition of Circus of the Spineless! Hey you in the back - yeah, you - the one with the spine - get outta here! This circus is only for the spineless! Since it's only us invertebrate lovers here, I know I can be honest with you - one of the reasons I think the spineless are so cool is that they can sometimes be very gross. You know what I mean - laying their eggs inside of other animals, eating them alive, etc., etc. So I thought that a nifty way to arrange this month's posts would be in order of grossness. Since beauty (and grossness) are in the eye of the beholder, you may not agree with my arrangement. You may even be offended. That's OK, I don't mind, I have thick skin (actually sort of an exoskeleton). Zen Faulkes at NeuroDojo writes about the correlation between coloration and toxicity of sea slugs. In a post about coloration, how could you not have some really beautiful photos? Zen does not disappoint! As glorious as the photos in Zen's post are the words in the poem submitted by Elaine Medline. Elaine writes about seeing the world through a dragonfly's eyes in her blog Memorizing Nature. Many creatures inhabit the middle world between beauty and beast. Amber Coakley at Birder's Lounge writes about the sawfly, which starts its life as a somewhat attractive larvae and ends up a scary looking adult. Or how about an insect that is graceful when observed from afar, but gets a little ugly if you get too close? JSK at Anybody Seen My Focus demonstrates this in a series of photos of a Great Blue Skimmer dragonfly, with very bugged-out eyes. Marine invertebrates can be that way as well, beautiful from a distance but like slimy phlegm up close. Check out the sponges and other creatures discovered by Susannah's grand-daughter at Wanderin' Weeta. Over at Wild About Ants, the "Consult-Ant" Roberta Gibson answers a question about ant pheromones. Ants are fascinating social insects and generally not too gross. A very interesting post! Back to Zen Faulkes at NeuroDojo, this time for a review of a field study of a cricket population. This was an amazingly comprehensive study by some very patient researchers. They even tagged the crickets, which makes for a pretty funny photo. We are now about halfway through our spectrum of grossness, so we are starting to tilt to the gross end. The Dragonfly Woman at her eponymous blog writes about aquatic insects being used as biological indicators of water quality. The Santa Cruz River in Tucson is 100% effluent (wastewater) and is filled with bloodworms. Need I say more? Next we visit the blog of yours truly, John at Kind of Curious, where we find a moth that disguises itself as a bird dropping. Or, as one of the commenters noted, a shelf fungus. Adrian Thysse, also known as The Bug Whisperer, provides a series of fascinating photos of an Ichneumon Wasp finding a larvae inside a log by echolocation, and then depositing its egg in the larvae. Now this is the kind of truly gross stuff I am talking about! It is no coincidence that the revolting end of this spectrum of grossness is heavily populated by arachnids. David Winter writes about conservation of the Katipo Spider at The Atavism. Maybe it's just me, but I think most people would run from this spider. Ted MacRae at Beetles in the Bush addresses the beauty/beast issue head on - he argues that jumping spiders are actually cute and cuddly! I'm not buying it, but he does provide some excellent close-up photos. As we near the end of the grossness scale, our more fair readers may wish to avert their eyes. 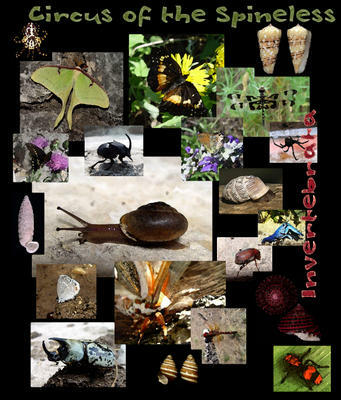 Michael Bok at Arthropoda provides an in-depth discussion (with photos!) of Camel Spiders, which are actually not true spiders but their own order within the arachnids. What could be more gross than a spider? How about a wasp dragging a spider back to her nest to lay her eggs it its body? David Winter provides some great shots of this at The Atavism. Finally, the post I have nominated as the most revolting, nauseating and disturbing of the bunch. Unfortunately, this one demonstrates the greed of humans, the short-sighted disregard of multiple procedures intended to protect other humans and our life-giving ecosystem. I am referring to the BP oil spill. Kevin Zelnio, administrator of Circus of the Spineless, submitted a post by Dr. Chris Mah on the Ocean Portal Blog of the Smithsonian Museum of Natural History. Dr. Mah's post describes the impact of the BP oil spill on invertebrates in the Gulf, which may be an even greater disaster than the impact on the more photogenic vertebrates we see on television. Well, that's a wrap for Circus of the Spineless #52. I hope nobody was offended if I called your favorite invertebrate "gross". It was all in fun. Next month, the spineless will converge at Birder's Lounge (I hope no one gets eaten!). Send your submissions to acoakley at birderslounge dot com. Love it! You're right; grossness (in the eyes of so-called "normal" people) is a plus. If I'd known your focus, though, I would have sent you a wormy post from last week. Some of the intertidal worms are seriously icky. Oh, I'm so glad that ants are not the grossest. LOL! Thanks for the fun roundup this month. What a great collection. And that jumping spider was in no way cuddly. Thanks for putting this together - lots of interesting links. I love the arrangement, even though jumping spiders are amazingly cuddly-looking. Thanks everyone for your nice comments! I have been on vacation so I am just reading them now. That's very nice and cute small animals. I like your blog as It give me many information about science and biology. So great to read. Keep doing good work and collect more pictures.